FIRST RACE: 1. Misdeed, 2. Supreme Commander, 3. Aqua Revelation. LONG SHOT: Next Right. SECOND RACE: 1. Seattle Charlie, 2. Katerrific, 3. Wasted at Midnight. LONG SHOT: Courageous Call. THIRD RACE: 1. Miss American Pie (best bet), 2. Awe’ Some Kitten, 3. Tempe. LONG SHOT: Valarta. Trainer Mark Glatt has been on fire lately, hitting on all cylinders. He claimed this lightly raced 4-year-old filly MISS AMERICAN PIE out of an even effort, going shorter last time. She goes longer and moves up in class plus Glatt is 32% first off the claim. Jockey Tyler Baze takes the mount and he has been riding well lately, too. FOURTH RACE: 1. Holiday N Newport, 2. Magic Number, 3. Thermal Nermal (SCRATCHED). LONG SHOT: She’s a Go Girl. New order: 1. Holiday N Newport, 2. Magic Number, 3. She’s a Go Girl. LONG SHOT: Sky Angel. FIFTH RACE: 1. Lil Swiss Echo, 2. Mark of a Gem, 3. Noise of the Crowd. LONG SHOT: Warren’s Dixi Bell. SIXTH RACE: 1. Warrens Puppy Love, 2. Warrens Lil Margie, 3. Marla Hooch. LONG SHOT: Pay the Debt. There’s a first time for everything and that’s what we’re hoping for here. Trainer Dean Pederson is 0-for-7 first off the claim, but jockey Joe Talamo sees fit to ride this 3-year-old filly WARRENS PUPPY LOVE despite the fact he also rode two others in this race last time. The daughter of Mongol Warrior has tactical speed and should relish the 7 furlongs. SEVENTH RACE: 1. Emollient, 2. Topic, 3. Floral Romance. LONG SHOT: Stormy Lucy. EIGHTH RACE: 1. Cool Samurai (SCRATCHED), 2. El Nino Terrible, 3. Papa Turf. LONG SHOT: Friendswith K Mill. New order: 1. The Admiral, 2. El Nino Terrible, 3. Papa Turf. LONG SHOT: True Ten. NINTH RACE: 1. Koast, 2. Mr. Bossy Pants (SCRATCHED), 3. Kilat. LONG SHOT: Candy’s Sunrise. New order: 1. Koast, 2. Kilat, 3. Candy’s Sunrise. LONG SHOT: Carbonite. Second, jockey Tyler Baze returns to the saddle after a suspension for substance abuse. Let’s hope he has his act together in his personal life and on the track. FIRST RACE: 1. Rebelution (SCRATCHED), 2. Sunland Vintage, 3. Glad’s Gals. LONG SHOT: Lethal Miss. SECOND RACE: 1. Govenor Charlie (SCRATCHED), 2. Little Jerry, 3. Fury Kapcori. LONG SHOT: Safety Belt. THIRD RACE: 1. Joe Carl, 2. Go to the Pulpit, 3. Cook Inlet. LONG SHOT: Romeo Royale. FOURTH RACE: 1. Right on Schedule, 2. Tommy’s Kid, 3. Atticus Scouts. LONG SHOT: Robertino. FIFTH RACE: 1. Setsuko, 2. Say Ow, 3. Ever Rider. LONG SHOT: Scorpion Warrior. SIXTH RACE: 1. Perfecta, 2. Smart N Dreamy, 3. Boller Bomb. LONG SHOT: Ricspretentiousgal. Interesting jockey switch here on PERFECTA, a daughter of Pleasantly Perfect. Joe Talamo has ridden three of the last four times, not necessarily with great success, so trainer Richard Mandella goes to the red hot Gary Stevens. They are a 40% proposition the last year so why try to fight it. SEVENTH RACE: 1. Betty Bing Bing, 2. Very Thankful, 3. Glorious Rebecca. LONG SHOT: Exclusive Girl. EIGHTH RACE: 1. Rever de Vous, 2. Full Ransom, 3. Sushi Empire. LONG SHOT: Saintly Joan. NINTH RACE: 1. Apache Ambush, 2. Second Proposal, 3. Goyan. LONG SHOT: Grand Humor. FIRST RACE: 1. Made to Worship (best bet), 2. Shakeitupbetty, 3. Cause Ur My babe. LONG SHOT: Wired for Fun. Trainer Jerry Hollendorfer is no slouch when it comes to winning with first-timers (25 percent) and this daughter of Ministers Wild Cat looks live with this bunch. Leading rider Rafael Bejarano will be aboard MADE TO WORSHIP. SECOND RACE: 1. No Tricks for Jack, 2. Born Lucky, 3. Ghost N Your Heart. LONG SHOT: Amulay. Trainer Victor Garcia is pretty good sprint to route (27%) and NO TRICKS FOR JACK has a big work over the Santa Anita dirt. This filly got bumped at the start last time and may have prevented a better effort. THIRD RACE: 1. Modern Empire, 2. Seeking the West, 3. Scarly Charly. LONG SHOT: Perfect Set. FOURTH RACE: 1. Black Witch, 2. Zanbo, 3. Heat du Jour. LONG SHOT: Fadeintoinfinity. FIFTH RACE: 1. Brown Is Beige, 2. Princess Suances, 3. Acute. LONG SHOT: Rachels Belle. SIXTH RACE: 1. Distant Image, 2. Noise of the Crowd, 3. Joeandbetty’sbaby. LONG SHOT: Blushing Martha. SEVENTH RACE: 1. Fashion Plate, 2. Star Sighting, 3. Beverly the Boss. LONG SHOT: Mum. EIGHTH RACE: 1. Moone’s My Name, 2. Gulsary, 3. Customer Base. LONG SHOT: Champagneandcaviar. Did fiasco at Breeders’ Cup result in Santa Anita’s change of track superintendent? Did Breeders’ Cup fiasco result in Santa Anita track superintendent change? Santa Anita Park has announced that highly respected trackman Dennis Moore will take over duties as Track Superintendent effective immediately. Moore has built and maintained track surfaces the world-over for the past 40 years and is currently in charge of main tracks at both Betfair Hollywood Park and at Los Alamitos Racecourse. A Southern California native, Moore, 63, has maintained surfaces at racetracks and training centers throughout North America and in Canada, Dubai, U.A.E., England, and Germany as well. Now one can’t help wonder if this change came about because trainer Bob Baffert was bitching and moaning about the Santa Anita main track before the recent Breeders’ Cup and the fiasco that was Thursday and Friday of Breeders’ Cup week when the dirt surface was a paved highway when you got inside, the lead and you probably won the race. Breeders’ Cup officials were none too happy with that surface on Friday which resulted in tractors hitting the surface soon after the last race and not stopping until morning training 12 hours later. The result was a much fairer track for Saturday’s championship races. No. 1, what track has its marketing director talk about the main track and where was Dr. Peterson on Friday when the track was apparently bone dry? According to my sources, Santa Anita’s main track superintendent before Wednesday was Andy LaRocco, not that you could find the information anywhere in the press guide, unless I missed it, and if it I did, I stand corrected. LaRocco holds the same position at Gulfstream Park in Hallandale Beach, Fla. This is the way track owner Frank Stonach tries to save money. Why have two guys with the same title when one will do? Never mind that Gulfstream and Santa Anita race at the same time of the year and don’t even remotely have the same climate. The fact that Moore became available because Hollywood Park is going out of business next month probably had something to do with the change, but I willing to bet the fact that the Breeders’ Cup is coming back to Santa Anita next year again had even more (no pun intended) to do with it. I’ve heard nothing but good things about Moore. Southern California trainers have routinely raved about the Hollywood Park surface as being the best in the state so it appears Santa Anita is getting a good one. Let’s hope so for everyone’s sake: owners, trainers, bettors and thoroughbreds. At least he lives in Southern California. The groans can be heard from outside the state lines every time Santa Anita Park is named to host the Breeders’ Cup, thoroughbred racing’s championship days. The Arcadia track will host the event for the seventh time in 30 years beginning on Friday with five races and continuing on Saturday with nine more races. 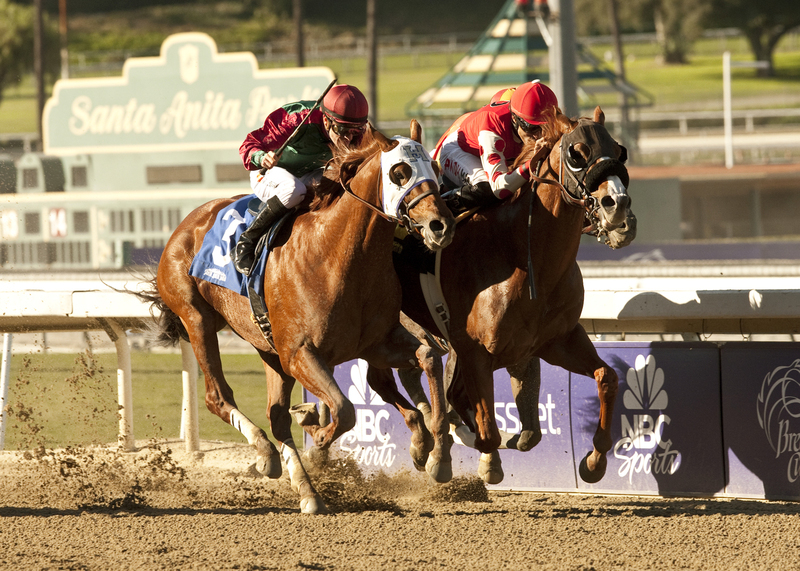 Santa Anita has already been named to host BC 31 next year, too. The howls from those in the industry and fans always complain about a home-court advantage for California’s entries, but some Eastern horsemen don’t mind. As Mott correctly later pointed out, if the Breeders’ Cup had been held in New York last year, Superstorm Sandy might have cancelled the proceedings and there was the year the event was held in a deluge at Monmouth Park in Oceanport, N.J. If truth be told, Californians may not have an advantage. Only two of the 15 races were won last year by California-based horses when Mizdirection took the Turf Sprint and Beholder scored in the Juvenile Fillies. In 2009, four of the 14 races were taken by Golden State connections for a total of 21 percent winners the last two times the event was held in Arcadia. When the draw was held for the 15 races only three California horses —- Mizdirection (4-1) trying to repeat in the Turf Sprint; Private Zone (3-1) in the Sprint and Game On Dude (8-5) in the Classic —- were made favorites by morning-line maker Jon White. That doesn’t mean California couldn’t come up big. Nearly 33 percent of the horses entered (49 of 150) are based in California, but Bob Baffert, Game On Dude’s trainer, says it’s not the same racing surface from year to year or even on a daily basis. That didn’t stop Baffert from entering eight horses this week —- Eastern-based Chad Brown entered an event-high 11. The silver-haired Baffert has big shots with Tap It Rich (6-1) in the Juvenile and Secret Circle (4-1) in the Sprint. Trainer Richard Mandella won four races when the Breeders’ Cup was held at Santa Anita in 2003. He will be looking for double this year with Beholder (5-2) in the Distaff on Friday and Indy Point (9-2) in the Turf on Saturday. The numbers say California’s best chances will come on Saturday when it has 50 percent (25 of 50) of the horses entered in the Filly and Mare Sprint, Turf Sprint, Juvenile and Mile.